On Saturday, July 20, join members of the Philadelphia community to celebrate the completion of the Big Green Block with a ribbon-cutting ceremony. Visitors can tour the space and enjoy speeches by community leaders such as Pennsylvania State Representative Mike O'Brien, Councilman Mark Squilla, and representation from Councilwoman Maria Sánchez's office. In addition to these events, resident Green Guide Anders Morholt will lead a DIY Rain Barrel Workshop. 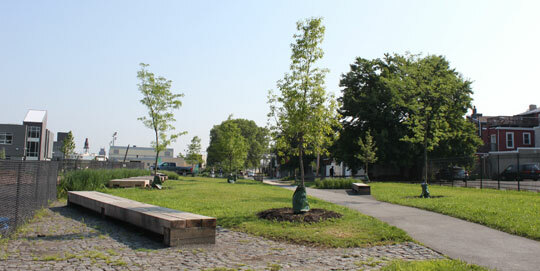 Featuring a stormwater management system as well as playground and recreational areas, the space evolved from a desire to green and beautify the area between Frankford Avenue and Front, Norris, and Palmer Streets. From the beginning, this project has been a community-wide labor of love, relying on the collaboration of the New Kensington Community Development Corporation and its partners the Philadelphia Water Department, the Pennsylvania Horticultural Society, Mural Arts, and Philadelphia Parks and Recreation. Last April, these organizations invited the community to help volunteer at the venue to aid in its completion. The upcoming celebration will be held from 11 a.m. to noon at the Shissler Recreation Center on 1800 Blair St. The rain date is Sunday, July 21. For more information, call Diana at 215.427.0350 x104 or email djih@nkcdc.org.